In this edition of Random Thoughts from the Humidor, I ponder what is meant by “flavored” cigars, keeping the palate fresh with milder smokes, and using cigars as currency for wagers. On Saturday I published a Quick Smoke of the Drew Estate MUWAT Kentucky Fire Cured (KFC) in the Just a Friend size. As I understand it, KFC is crafted at Joya de Nicaragua using tobaccos that are cured in a barn under fires of hickory and maple. The smoke from these fires imparts (in the case of Just a Friend, according to my palate) notes of barbeque sauce, chewy meat, hickory, leather, sweet tobacco, and peat. It’s an interesting product and process, though the cigars aren’t my cup of tea. In any event, some readers got me thinking with their comments. I hadn’t previously considered KFC to be flavored. Regarding cigars, I take “flavored” to mean infused with artificial flavors that are not naturally inherent in the tobacco leaves as a result of growing, cultivation, curing, fermentation, etc. 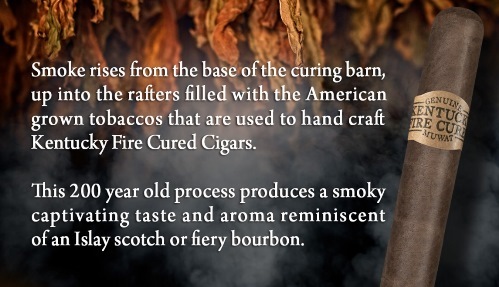 So, in my eyes, fire-curing tobaccos—or barrel-aging them, for instance—does not make them flavored. I still think of these cigars as differentiated from, say, Flavours by CAO or Acid by Drew Estate. Perhaps the distinction is not important and this is simply a matter of semantics. Perhaps, though, as the government gets more and more involved in the regulation of premium cigars, this will become an important issue. Recall that a previous FDA proposal stated that under its option for a premium cigar exemption, a cigar would only qualify if it “does not have a characterizing flavor other than tobacco.” Would using fire-cured tobacco or tobacco aged in rum barrels be a violation? What about aging a finished cigar in cedar? To date, the FDA has not provided answers. And, in a particularly troubling development, we’ve learned it may not matter; an unauthenticated draft of the FDA’s deeming rules submitted to the Office of Management and Budget (OMB) was recently leaked, and the draft shows no exemption for premium cigars. But ultimately, if OMB reinstates an exemption for premium cigars, the notion of “flavored” may become very important. I’m guessing most cigar smokers started smoking milder cigars, graduated to medium-bodied sticks somewhere along the way, and these days tend to focus on smokes with full body and strength. These seasoned cigar veterans may avoid mild cigars entirely, or they may relegate them to that occasional morning smoke as an accompaniment to a cup of coffee. (I’m basing these broad generalizations off anecdotal evidence, hundreds of conversations, and observations from the ever-expanding world of social media.) To these brothers of the leaf I say this: Don’t be afraid to mix up your rotation with a milder cigar now and then. Not only are these cigars highly enjoyable, but they often provide subtler, more delicate flavors that are harder to find in Nicaraguan powerbombs. Think almond, cream, hay, etc. As an added bonus, you may find your full-bodied favorites taste even better when you sprinkle in a Connecticut Shade smoke from time to time. I’m a lifelong Cubs fan and my colleague, Patrick S, is a diehard follower of the Mets (nobody’s perfect, right?). This year, our teams squared up in the National League Championship Series. Before play started—and long before the Mets were eventually vanquished by the Kansas City Royals—we each agreed to send the winner a five-pack of local cigars as a friendly wager. If the Cubs won, he was going to send me hard-to-find smokes from the PG Boutique near his home in Virginia. If the Mets won (as they did), I’d send a sampler of house blends from Tesa here in Chicago. Maybe it’s just me, but for friendly wagers—especially those that are sports-related—cigars just seem to be a more fitting form of payment than money, not to mention a chance to acquire smokes that can’t easily be bought locally. Anyone who reads Stogie Guys probably mixes up the rotation. That’s why we read it. Variety is the spice of life (long as it’s not infused). Why drink one bourbon? Smoke one kind of cigar? Listen to the same CD over and over again? I won’t be a bit surprised if the FDA mucks it up for everyone. And yes, as others have suggested, there will be lawsuits. It is absurd overreach.